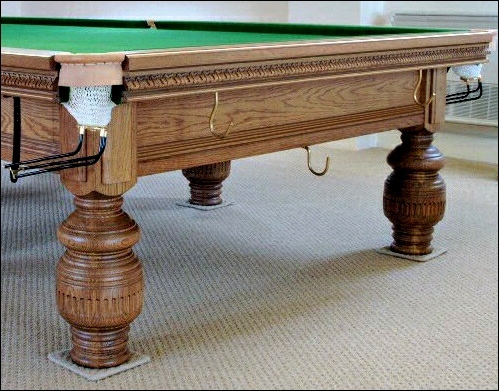 Alan Phillips snooker tables can be made from a range of different timbers including Mahogany, Oak, Ash, Maple, Walnut and Cherry and can be customised to your requirements including colour matching. Alan Phillips snooker tables are crafted with the ultimate care to produce a smooth playing surface, together with an impressive attention to detail. Alan Phillips snooker tables are supplied complete with matching scoreboard and cue rack. Snooker tables delivered to Yorkshire, Lincolnshire, Durham, Teeside, Sussex, Norfolk, Leicester and Nottingham. Alan Phillips Snooker. Snooker table manufacturers and snooker table fitters. Alan Phillips snooker tables delivered to New York, Washington, Dallas, Chicago, and the rest of the USA. Alan Phillips snooker tables. Snooker tables delivered to Leeds, Manchester, Liverpool, Birmingham, Bristol and the rest of the UK.